Interim Dean James A. Gardner thanks keynote speaker New York Lt. Gov. Kathy C. Hochul. “It’s tough to make predictions, especially about the future.” Yogi Berra’s words, as quoted by interim Dean James A. Gardner, formed the backdrop for the School of Law’s 128th Commencement. The afternoon’s keynote speaker, New York Lt. Gov. 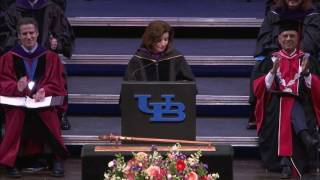 Kathy C. Hochul, said she had given many commencement addresses to undergraduates, but never before to new J.D.s. “I have a very different message for you,” she said. “You are sworn to uphold the Constitution of the United States of America. You are no longer a bystander in democracy, you are sworn to protect it. Christen E. Civiletto, an adjunct faculty member at the law school, was presented with the Ken Joyce Excellence in Teaching Award. Civiletto is an attorney and author of Green City Savior—an environmentally themed suspense novel set in Niagara Falls, N.Y.
Additional awards presented during the ceremony included the Staff Award given to Dawn Skopinski and the Faculty Award, given to Professor S. Todd Brown.